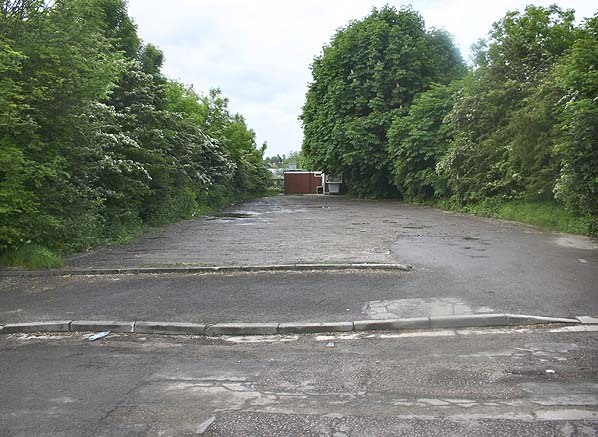 Present state: Demolished - the embankment has been removed but the site has not been redeveloped. Notes: The station at Hemel Hempstead was always spelt Hemel Hempsted both by the Midland Railway and later by the LMS. This spelling always appeared on tickets, timetables and signs on the station. In this report when specifically referring to the station 'Hempsted' will be used but when referring to the town the correct spelling of 'Hempstead' will be used. Heath Park Halt was opened on 9th August 1905 to coincide with the introduction of the railmotor service. It had a single short platform built entirely of wood with wooden steps up from the road and wooden slatted fencing at the rear of the platform. Initially there was no shelter. The halt brought some additional passengers to the line. In 1907 a petition was raised to provide a shelter at all three halts and these were later provided. North of the halt there was a short branch to the left serving the goods depot and Cotterells sidings which also handled coal and was a distribution point for 'London sweepings'. In those days road sweepings consisted mainly of animal droppings which were used as a fertiliser by farmers. Although Heath Park Halt closed in 1947 the goods depot remained open until 31st August 1959. Heath Park Halt was demolished in 1960 and the embankment removed during the redevelopment of the town centre however its position is clearly visible today and the site of the halt has not been redeveloped. The London & Birmingham Railway opened in 1837 and although it passed near Hemel Hempstead, due to vigorous lobbying by local landowners, it was routed on the other side of the River Gade some distance from the town. A station was built on this line at Boxmoor (renamed Boxmoor & Hemel Hempstead in 1912) but no connection was provided into the town by rail. Railway at Harpenden. However, Grover's design found a sponsor and following an Act of Parliament in 1863 the Hemel Hempstead and London & North Western Railway Company was formed to construct and operate the line. However, no construction work was undertaken due to difficulties with local landowners and problems agreeing the connection to the main line at Boxmoor and after a number of years of stagnation the earlier proposals were re-examined. Parliamentary approval was obtained in 1866 and construction work began. 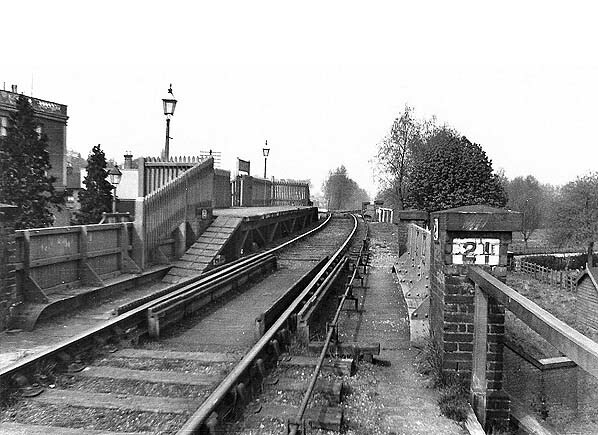 Construction proceded extremely slowly, the lower spur from Boxmoor to Hemel Hempstead only being completed by 1871, though the connection to Boxmoor was via an awkward turntable. Eventually, the HH and L&NWR Company ran into financial difficulties and it was the Midland Railway that came to the rescue, financing completion of the line and agreeing to operate it once it was built. The line was finally opened on 16th July 1877 with four passenger trains each day running between Hemel Hempsted and Luton stopping at Redbourn and Chiltern Green (on the GNR main line) with a journey time of 40 minutes; there was also an evening goods train. It provided a link for the straw plait trade that existed in Hemel Hempstead with the hat making centre of Luton and this is reflected in the fact that the initial connection at Harpenden headed north towards Luton rather than south towards London. Passengers travelling to St. Albans and London changed trains at Chiltern Green. The terminus for the new line was on the south side of Hemel Hempstead on a viaduct extending across low lying ‘Marlowes’. Passengers on the new train service were able to reach St Pancras faster than those who took a pony and trap to Boxmoor station and then travelled to Euston. Hemel Hempsted station itself was a mile north of the terminus and was usually referred to as the 'Midland Station'. It stood on the site of a modern housing development, opposite the Midland Hotel. The company built a single road timber engine shed in the north west corner of the goods yard, this opened with the line in 1877 but was an early casualty closing in c.1910. After closure the line's locomotives were shedded at St. Albans until that closed in the 1950's then engines were stabled at Cricklewood. direct connection to St. Pancras and one through train to St. Albans. The 9am train from St. Pancras 'slipped' a coach at Harpenden to run onto the branch. Although the link with the L&NWR was completed it was not in the Midland's interest to open the connection to regular traffic as it would have provided a shorter route into London for both passenger and freight traffic. However from 1886, regular coal traffic used the connection to reach a gas works at Duckhall. This was always the principle freight traffic on the line although some local companies used the line to carry their goods to market , in particular the well-established paper firm of John Dickinson. There were also some wagons of mixed freight carried each day including watercress. The rivalry between the Midland and L&NWR grew intense and on one occasion track was lifted at Boxmoor by angry L&NWR workers to prevent a goods train that had travelled along the Midland Railway from completing the journey to Boxmoor. 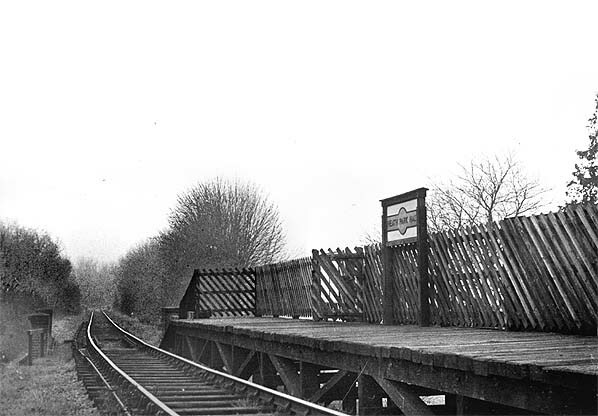 Due to this rivalry no passenger trains ever operated between Midland Station and Boxmoor and eventually the connection was permanently severed in c.1916. 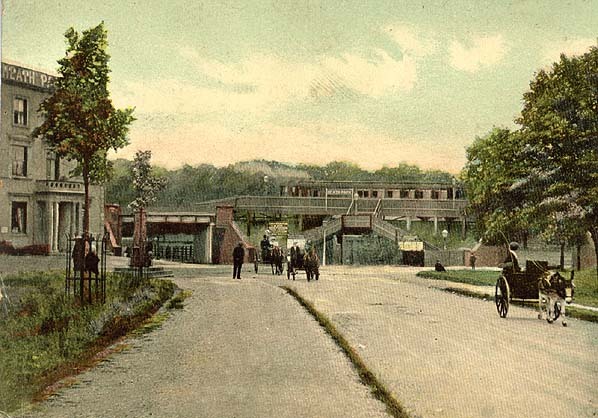 In 1905, a passenger terminus was opened at Heath Park Halt in an attempt to compete with the L&NWR, which had started a bus service to transport passengers from Hemel Hempstead to the main line station at Boxmoor giving passengers a journey time to London of 1 hour 35 minutes compared to 1 hour 56 minutes via the Midland route. Other halts were also opened in 1905 at Godwin's on the northern outskirts of Hemel Hempstead and Beaumont's on the west side of Redbourn. These halts were opened to coincide with the introduction of a railmotor service with an increase to nine daily trains, four of them starting at Heath Park. The railmotor service continued into the 1920's but with a reduced frequency after WW1. With the Midland and L&NWR absorbed into the LMS through workings between the lines might have been expected but this never happened. Roundwood Halt was opened to the west of Harpenden in 1927 to serve a new housing development. In 1929 the LMS introduced an experimental bus service running alongside the line and stopping at all stations including Boxmoor & Hemel Hempstead. The new service was a great success, carrying more passengers in its first week than the train did in a month. Following the success of this experiment, the LMS trialed a hybrid road-rail vehicle called 'Ro-Railer' in 1931 in an attempt to compete with road transport. Looking like a bus, the vehicle could be used both on the road and on rails. The experiment was short-lived and did not catch on and was withdrawn in 1933. The regular passenger service on the line had been reduced from seven to four daily trains in 1929 and it remained at this level until the outbreak of WW2. During the war, additional traffic used the line including evacuees from London and military transports carrying tanks and other equipment were regularly seen. In December 1943 the Middlesex Regiment was billeted in Hemel Hempstead bringing additional passenger traffic to the line. Passenger demand was never high and had declined during the inter-war years. The rivalry between the Midland and L&NWR companies ensured that the line ultimately failed to serve the people of Hemel Hempstead in the most useful way possible. After WW2 it was clear that the passenger service couldn't survive and the last passenger train ran a few months before nationalisation on 16th June 1947, when there was a 'temporary' suspension of services due to the national coal shortage. When coal was once again available the service was never reinstated. The last passenger trains, after closure, were three enthusiasts’ specials. The Railway Correspondence & Travel Society (RCTS) organised two trips to Heath Park Halt on 11th May 1957 and 10th August 1958 and the South Beds Loco Club organised an excursion between Harpenden and Hemel Hempsted on 24th September 1960.
programme. A large crowd assembled at midnight on 6th July 1960 to see the viaduct being blown up. The link line was now the only way of bringing in coal into the gasworks at Duckhall but the gasworks closed in 1960. Hemel Hempsted remained open as Midland Road for freight traffic until 1st July 1963 although by that date there had been no traffic for some time. Redbourn remained open for a further year closing on 6th July 1964. At least part of the line still had a future however. In the late 1940's a company had been established to make clinker blocks at the former Claydale Brickworks between Godwin's and Beaumont's. Initially the old brickworks sidings weren't used but in 1958 a huge investment programme brought new modern plant producing blocks under the trade name Hemelite. New reception sidings were laid and from late 1959 six wagons of aggregate arrived each day. In the early 1960's the line came under the threat of the Beeching Axe and it was eventually sold to the Hemelite company after parliamentary approval was received; the company taking control on 30th April 1968. It was the first BR line to be taken over by a private company. The reprieve was to be short lived however and the end came on 24th July 1979 when BR removed the junction as part of an grading the Bedford line though Harpenden. BR wanted to charge Hemelite a large sum of money to replace the access points just north of Harpenden Station. The cost was too much for the company to afford as they were struggling through a recession so they lost access to their line with deliveries continuing by road. The remaining track was lifted in 1982. In the early 1980’s the railway land between Midland Road in Hemel Hempstead and Harpenden was purchased by St Albans District Council and Dacorum Borough Council. The line was opened to the public in 1985 for use as a footpath and cycleway. Since then, many improvements have been undertaken along the line including surfacing and the construction of steps and access points. The line is part of the National Cycle Network (the Oxford to Welwyn Garden City route) and this section is approximately nine miles long. centre up through Highfield was steep and the engines created much steam and smoke ascending this grade. Click here to see an aerial view of the whole Harpenden - Hemel Hempstead line line on Google Earth. All the stations are shown. Prepared by Mark Percival. Other web sites: Friends of the Nickey Line footpath and cycleway. Includes history of the line and maps of the current footpath. The Nickey Line - The Harpenden to Hemel Hempstead Railway. excellent web site with history of the line and pictures. Plus details of how to obtain the Nickey Line DVD. Nickey Line - a video tour of the Nickey line today lasting over 1 hour. Lost lines - Photographic tour of the Nickey line in 1990. To see other stations on the Harpenden to Hemel Hempstead Railway click on the station name: Hemel Hempsted, Godwin's Halt, Beaumont's Halt, Redbourn, Roundwood Halt & Harpenden. Heath Park Halt looking north in 1934, , the line to Cotterells Depot can be seen heading roughly straight ahead with the main line to Harpenden Junction diverging to the right. Heath Park Halt looking south in November 1945. The site of Heath Park Halt looking south in May 2006. A bridge crossed the road and this point and the halt was on an embankment roughly where the trees are. Aerial view showing the position of Heath Park Halt and the now removed embankment. 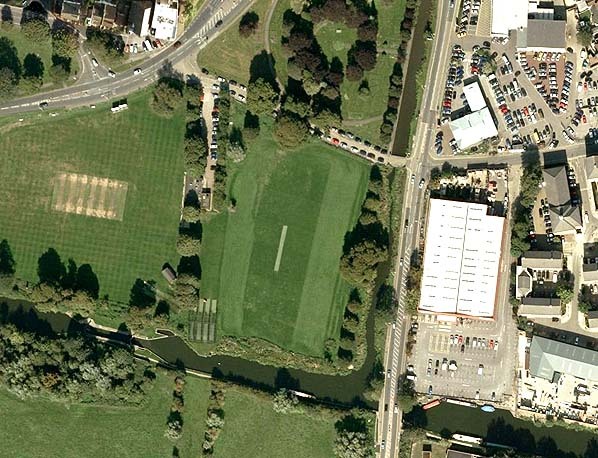 The site of the bridge over the Grand Union canal is also clearly visible.